"There are some things that we haven't gotten done. 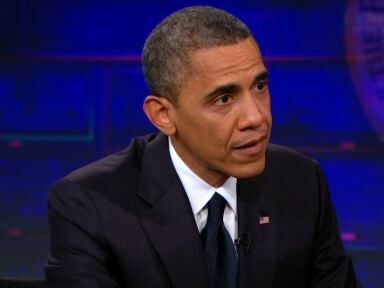 I still want to close Guantanamo, we haven't been able to get that through Congress," President Obama said during an appearance on Comedy Central's "Daily Show" with host Jon Stewart on Thursday. Interestingly, Obama also talked about limiting the power of the executive, including himself. "One of the things that we got to do is put a legal architecture in place, and we need Congressional help to do that. To make sure that not only am I reigned in, but any president is reigned in terms of some of the decisions that we're making," Obama said. MSNBC's O'Donnell Challenges Romney Son To Fight: "Take Your Best Shot"
Obama: "If Four Americans Get Killed, It's Not Optimal"
Mark Levin: How Does Obama Select Personnel Without Using Binders?